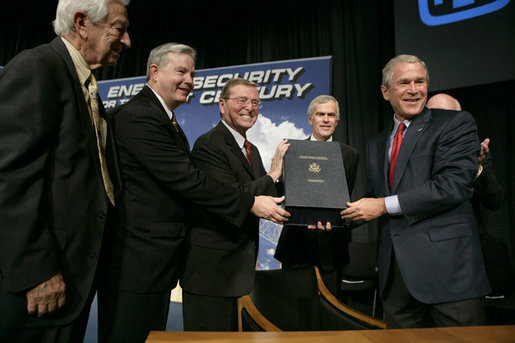 Following four years of unsuccessful attempts to pass an energy bill, the 109th Congress took up an energy bill again in 2005, with a House version passing in April and a Senate version passing in June. The Senate and House both approved a conference bill with substantial majorities in late July, and the President signed the bill on August 8. ACEEE estimated the bill would save about 2% of U.S.energy use in 2020, compared to about 10% for a bill with our recommended efficiency provisions. See the press release, Conference Energy Bill Misses the Big Targets, for ACEEE's comments on and summary of savings estimates of the final bill. Efficiency Title. The energy efficiency title includes new equipment efficiency standards for 16 products and calls for the U.S. Department of Energy (DOE) to set efficiency standards via a rulemaking on three products. Aside from provisions on standards, this title addresses combined heat and power, appliance labeling, research and development, efficiency in federal and public facilities, building energy codes, public housing, and other efficiency topics. Tax Title. The final bill includes $2.3 billion in incentives for high-efficiency vehicles, new and existing homes, commercial buildings, and for manufacturers of high-efficiency appliances. Vehicle Fuel Economy. EPACT 2005 marginally weakened the existing CAFÉ situation. ACEEE analysis indicated that full use of this loophole could erode actual fuel economy of the U.S.fleet by up to 5%. Electricity Title. In the electricity title, the final bill contains new Public Utilities Regulatory Practices Act (PURPA) compromise language that sustains the ability of combined heat and power facilities and other non-utility power generators to sell power into utility grids.